Craft & Vision has just released what I consider to be their best eBook yet. 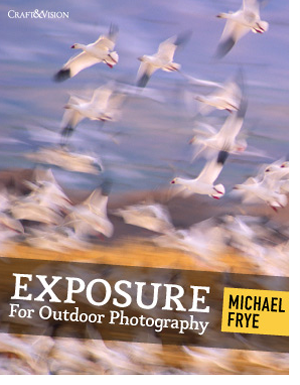 It’s entitled Exposure For Outdoor Photography by Michael Frye. If you have ever wondered what aperture you should use for landscapes, where to focus, how to blur a waterfall or stream, what the different metering and exposure modes are, what those weird histogram charts really mean or how to get the correct exposure in your outdoor photos then this is the book you want to start reading today. I read this book in one sitting because I couldn’t put it down. Why does exposure matter? Because as amazing as your composition might be if it’s over/under exposed or soft and out of focus it really doesn’t matter. But hit all the right notes of a great exposure and you’ve got something that can really stand out as a great image. In order to get there though, you have to understand the fundamentals, which is where this book starts out. Michael talks about the Exposure Triangle (aperture, shutter speed, ISO) and the role each of these plays in exposure and how they affect things like motion blur and depth of field as well as negative things like noise/grain. This is seriously a really strong section of the book and you will come away with a real understanding of terms like f-stop and stop increments. The book then talks a bit about exposure and metering modes and slowly prods you into exploring the magical world of manual mode. Now manual mode may sound scary at first but this book will erase that fear and put you at ease of determining what settings you need to make a correct exposure. If you have always been confused about what a histogram is and how to read it correctly then you are in luck. Michael has a very detailed section on what the histogram means and which sections are the most important (left and right edge) and what warning signs to look for in your histograms. One shooting situation that has always caused me problems is high contrast scenes. What settings do you use when you have a wide dynamic range that is often more than what the camera sensor can handle? This book addresses that situation and offers up different ways of dealing with capturing those images. Each case study is an in-depth discussion on how to set your camera to capture the scene, how shutter speed, aperture and ISO work together to get the right exposure. Being able to read the information and see it applied to real world images makes these case studies really valuable for anyone learning how to capture correctly exposed images. This book aims to teach you the foundational methods to use so that given a rapidly changing scene you have the knowledge to quickly change your settings to capture it as you see and interpret the scene before it disappears forever. In that respect I think this book is a home run. You can get the book now for only $4 if you use code EXPOSURE4 on checkout. This code expires on February 20th so don’t wait. After that the price goes up to $5. Either way it’s a fantastic deal! Share this post with a friend who is learning photography.